Oysters naturally grow in estuarine bodies of brackish water. When farmed, the temperature and salinity of the water are controlled (or at least monitored), so as to induce spawning and fertilization, as well as to speed the rate of maturation – which can take several years. Oysters start out as larvae, so small that they are invisible to the naked eye. In about a year, they can grow to 1 – 3-1/2 inches. Oyster larvae, about the size of pepper flakes, are taken and put on to an oyster shell. These shells are put in huge water tanks for three days allowing the larvae time to attach to the shell where they will remain for their lifetime. Then, these oyster shells are taken out on a barge especially made for shallow water and spread out on oyster beds. The oysters take about 3 years to grow forming groups of clusters on stakes in the tide lands. There are many different types of oysters but the ones Clausen’s currently grows are the Pacific oyster and the sweeter Kumamoto oysters. 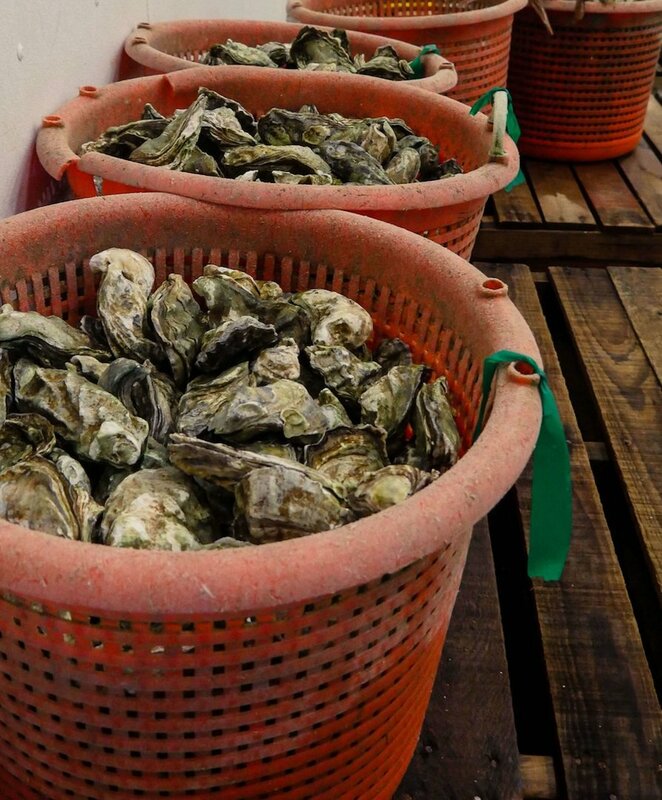 After about three years, the oysters are harvested from the barge and brought into the temperature controlled plant to be processed. At the processing center, the oysters are separated from their cluster, checked for quality and sorted by size. 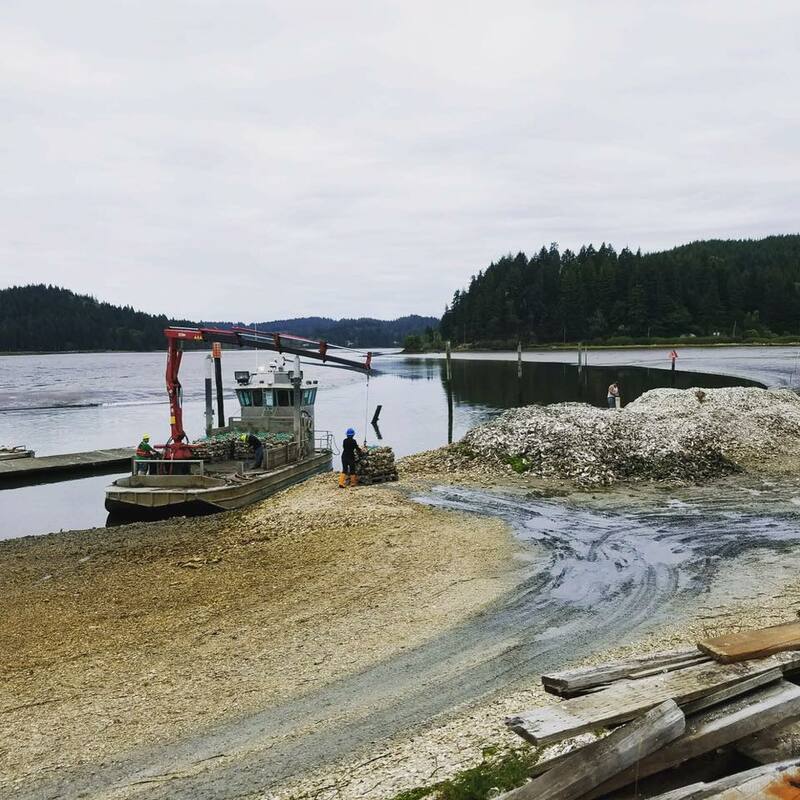 Our oysters are harvested by barge and unloaded onto the dock. Here, live oysters are washed with a high powered water spray, shoveled onto the conveyor, and placed into the large cooler within 4 - 5 hours of harvest. Pallet by pallet, oysters are brought back out into the "break room" where the clusters are singled out (with air hammers) and sorted by size. Then the single oysters are washed again and brought into the packing room.